Ireland has probably the most anti-Israel head of state in the western world. 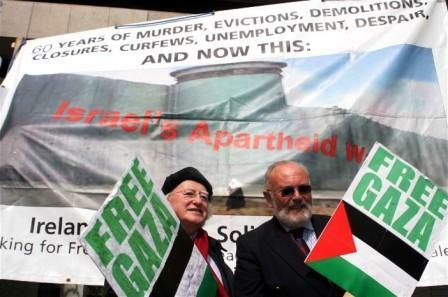 The President, Michael D. Higgins, was for decades the leader of anti-Israel politics in the Irish parliament. He mourned the death of Yasser Arafat. He objected to Hamas being labelled terrorists. He signed up to share a platform with Hezbollah. 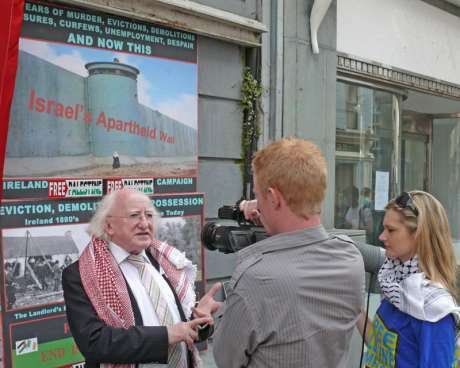 He called for Irish people to boycott Israeli goods. As President, since 2011, he has largely shut up about Israel, which is wonderful. He still finds time as President to indulge his love for reactionary right-wing Islam, though. Michael D. Higgins attends a candlelit vigil in Galway, 2004, mourning the death of the Jew-killing terrorist Yasser Arafat. Michael D., as part of a crackpot anti-Israel European delegation, 28 August 2005, calls for the removal of "all settlements, the more than 400,000 settlers" from the West Bank. His delegation claims, despite all the evidence, that suicide bombings are "executed by Palestinian non-state actors". His delegation claims that the Israeli occupation is the cause of the conflict! "The Delegation views the continuing occupation and these policies as the root cause of the current deadlock"
Michael D. attends a candlelit vigil for the dictator Arafat, Nov 2004. Michael D. in the Dail, 27 Nov 2007, objects to Hamas being labelled a terrorist organisation. "Several questions immediately arise from the Minister of State's response. ... Does he agree that the credibility of the European Union is badly damaged by, in the first instance, the clearing house decision that added Hamas to a proscribed list, with no accountability to this Parliament or any parliament in Europe, and, following that, its failure to recognise the result of the election, which was acknowledged as free and fair by several international bodies, including the Carter Centre? " Note that Michael D. believes Hamas were "elected" in 2006. If so, perhaps he would like to tell us where their parliamentary opposition is today? 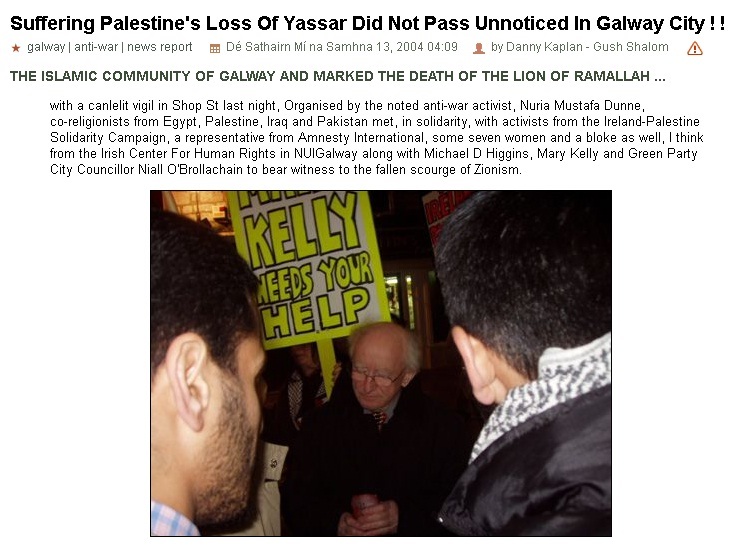 Michael D. Higgins in May 2008 claims the life-saving Israeli wall is about "apartheid" rather than about (successfully) stopping Islamic terrorism. Michael D. Higgins and David Norris at an IPSC rally in 2009. No they don't mean free Gaza from sharia. 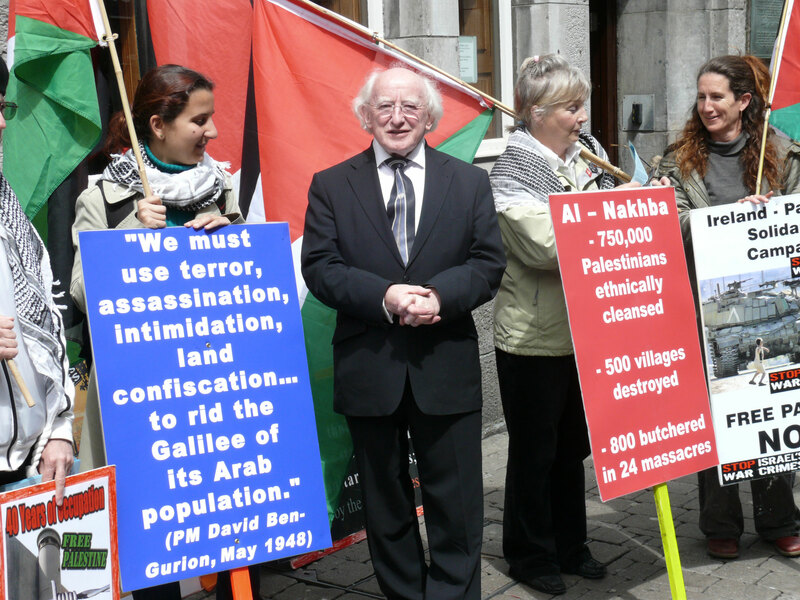 Michael D. attacks Israel in the Dail, 1 June 2010, after the "Free Gaza" flotilla clash. He claims the blockade of Gaza is about "collective punishment" and seeking "to punish an entire population" rather than about protecting innocent life. If the government of Gaza stopped terror attacks and just left Israel alone, the blockade would end immediately. He supports the flotilla: "I would like to hear ... that there will be an end to the attempts to try to blacken the people involved in these activities by the suggestion that they are somehow supportive of terrorist action." He fails to even discuss, let alone refute, the flotilla's links to terror. He naively claims there is "division within Hamas between the political wing and those in favour of military action." He does not present any evidence of this "division". 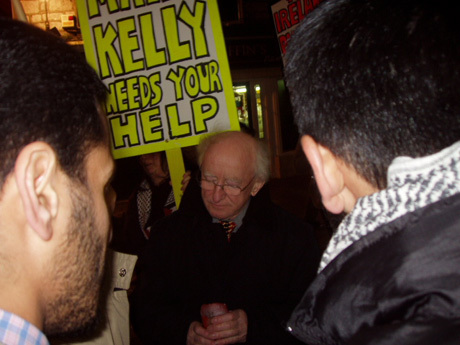 Michael D. at an anti-Israel demo, Galway, May 2007. He stands beside a fake quote which is falsely alleged to be from David Ben-Gurion. Michael D. Higgins signs a 2004 petition calling for a boycott of the lone democracy of Israel. Michael D. and the other signatories (who include members of the terrorist group SF-IRA) call for the ethnic cleansing of the 550,000 Jews in the West Bank and East Jerusalem. They absurdly believe this will bring "peace". 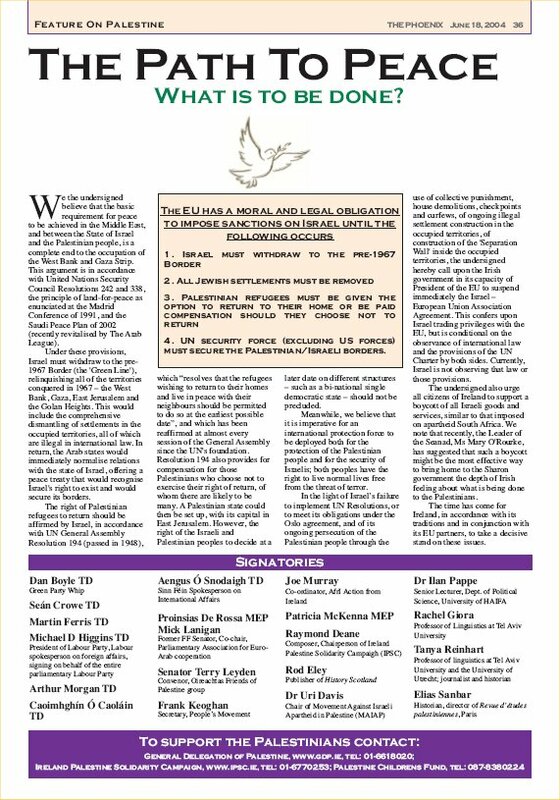 They also want a boycott of Israel: "The undersigned also urge all citizens of Ireland to support a boycott of all Israeli goods and services". Michael D. Higgins signed this petition calling for a boycott of the democracy of Israel in Jan 2009. Of course, he has signed similar petitions calling for a boycott of the non-democracies of China, Russia, Cuba, the Palestinian Authority, Pakistan, Saudi Arabia, Iran, Sudan and Syria. I'm sure he has. Show me where he has signed such petitions here. 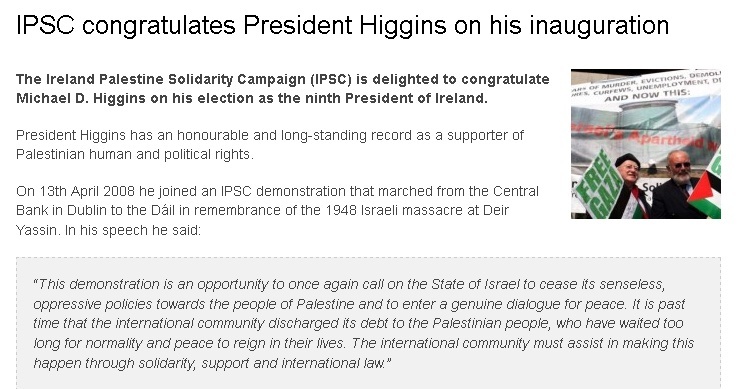 Ireland Palestine Solidarity Campaign welcomes Higgins as President, 10 Nov 2011. 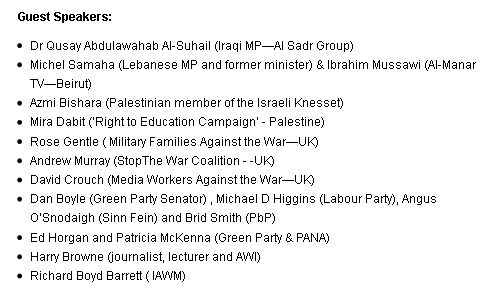 Michael D. was signed up to share a platform with Hezbollah at this disgusting anti-Israel event in Oct 2007. Alan Shatter queried this in the Dail, but Michael D. did not explain or back down. In the end, it was all academic. The Hezbollah man was refused a visa on security grounds. So technically none of the Irish useful idiots shared a platform with Hezbollah. 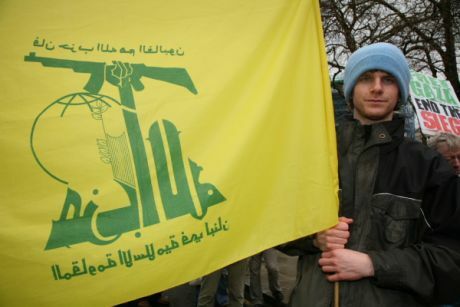 Hezbollah terrorist flag openly displayed at anti-Israel march, Dublin, Apr 2008. From here. Michael D. Higgins spoke at this march. 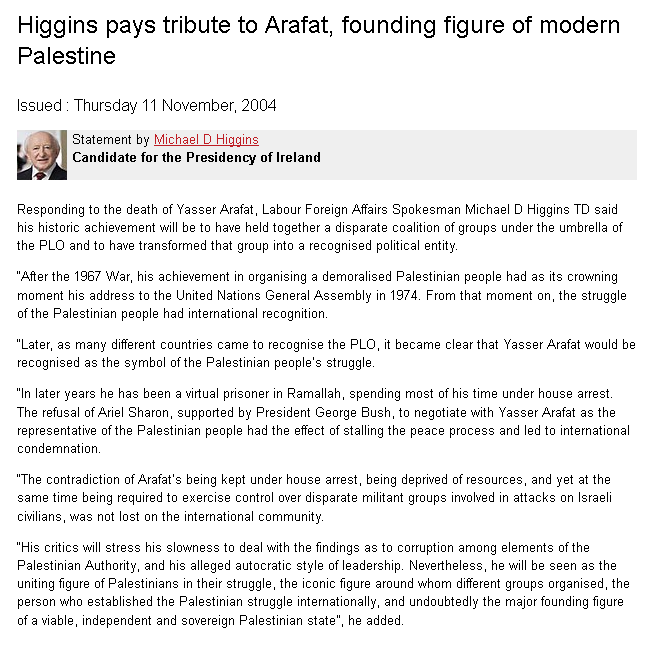 When the Jew-killing butcher and dictator Yasser Arafat, the father of modern terrorism, died in Nov 2004, Michael D. Higgins paid tribute to him. Michael D. Higgins attends a candlelit vigil in Galway, 12 Nov 2004, mourning the death of the Jew-killing terrorist Yasser Arafat. "the fallen scourge of Zionism"! I prefer to think of him as a kind of butcher of Jews. Michael D. pays a sick tribute to the father of modern terrorism on his death in Nov 2004. He talks about "his achievement in organising a demoralised Palestinian people" without mentioning that this was all based on terrorism against Jewish civilians. The failure of the peace process is ludicrously blamed on Bush and Sharon, rather than on Arafat launching the Intifada! Higgins repeats the absurd propaganda that "disparate militant groups" were carrying out the terror attacks that Arafat was carrying out. We are meant to care about the poor old butcher "under house arrest", rather than about the innocent women and children he killed. And "his alleged autocratic style of leadership" is as close as Higgins gets to referring to the fact that Arafat was an unelected dictator, who could have set up a democracy with a parliamentary opposition and a free press, but chose not to. The anti-American, anti-Israel, Irish politician Michael D. Higgins (later the Irish President) debated American conservative radio host Michael Graham on Newstalk radio, Ireland, 28 May 2010. (Just before the Gaza flotilla clash.) The debate was mainly on the topic of Israel, a country Michael D. Higgins is incredibly hostile to. Bizarrely, a heavily edited version of the debate (i.e. only Michael D. speaks) suddenly went viral among lefties in Aug 2012, two years later. Lefties claimed Michael D. actually won the debate! They did this using the simple trick of only presenting his words, and not the replies! A comment here points out: "all my conversations would be awesome too if you didn't hear the replies of those I was arguing with". One leftie headlines it: "Tea Party Boston Host Michael Graham Has No Words". Um, yeah, that's because they were edited out. The guy who made it go viral absurdly describes it thus: "A Tea Partier Decided To Pick A Fight With A Foreign President. It Didn't Go So Well." In reality, if you listen to the full debate, you will see that Michael D. lost the debate. It's well worth listening to. Michael Graham destroys him. It would be more accurate to say: "A Whining Anti-American Foreigner Decided To Pick A Fight With An American Conservative. It Didn't Go So Well." Don't listen to the fragments of Michael D. put up by lefties. Listen to the full debate. If you listen to the full debate, it is clear that Michael D. lost. Michael D. notes there was an attempt on the life of the head of the UNRWA in Gaza, Irishman John Ging, without having the guts to tell us that it was Islamic jihadists that tried to kill him. He leaves the listener thinking it was Israel. Disgraceful. Michael D. dodges and dodges again the question of why there are rocket attacks against Israel from Gaza. He attacks Michael Graham and describes American support for Israel as "fundamentalist madness". But he never answers Michael Graham's question. He disputes that Israel has intercepted boats carrying arms from Iran to Hezbollah and Hamas. Michael D. is clearly not very well read about this issue. He praises Obama and attacks "this Tea Party ignorance". How is this offensive man going to manage if he has to receive a Tea Party President? He refuses to answer as to whether Rachel Corrie was standing in front of a weapons tunnel. Unlike Irish people, Michael Graham isn't afraid of this Euro-leftist and his half-baked opinions. Michael D. ends up calling him a "wanker". Michael Graham reacts to the heavily edited version of the debate (i.e. only Michael D. speaks) going viral among lefties in Aug 2012. Back in 2010, Michael Graham responded by saying: "Now, regular listeners to the show know I get called far worse than "wanker" on a regular basis. So I barely noticed it. ... Personally, I found Deputy Higgins' weak logic and unwillingness to acknowledge facts far more bothersome than the name calling." 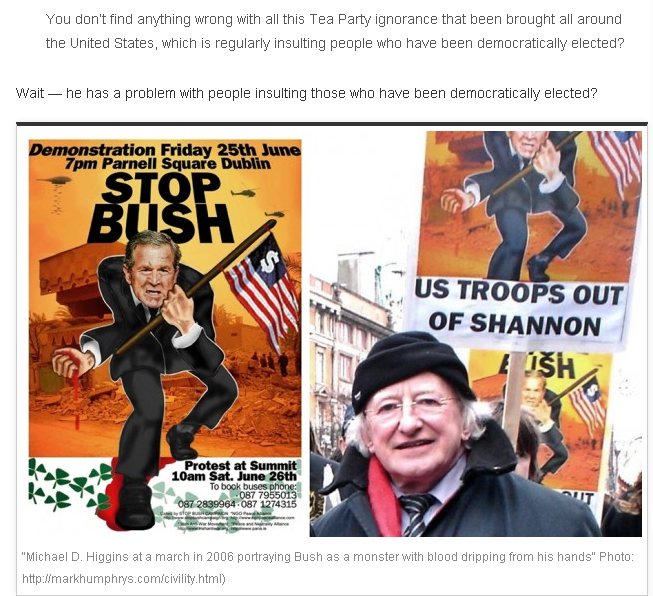 Among all the tedious gushing about Michael D. by Irish and American lefties in Aug 2012, I got a nice link from Glenn Beck's site The Blaze, 23 Aug 2012, who discovered my photos of Michael D. at the anti-American demo. Thanks guys! If only such scepticism existed in the Irish media! Jack Meehan, the Bush-era President of the Ancient Order of Hibernians, also uses my site as a source. He is highly unimpressed with Michael D.'s speech (and here). He is angry at Michael D. for "the reprehensible protests which were specifically designed to ridicule the valiant men and women of our American military who were passing through Shannon Airport. He has the unmitigated nerve to call somebody else "a wanker"". The Israel-bashing was drastically scaled back when Michael D. became President. It was not as bad as I feared. However, he did find occasions to indulge his love for reactionary right-wing Islam. President Higgins, International Women's Day, 2018, promotes the Palestinian "struggle" for "rights". Disgusting. The Palestinians do not believe in human rights and they certainly do not believe in women's rights. And their "struggle" consists of endless terrorist war crimes against civilians. President Michael D. Higgins in July 2013 honours Umar Al-Qadri, who calls Hamas "my brothers and sisters" and says "Hamas loves peace." 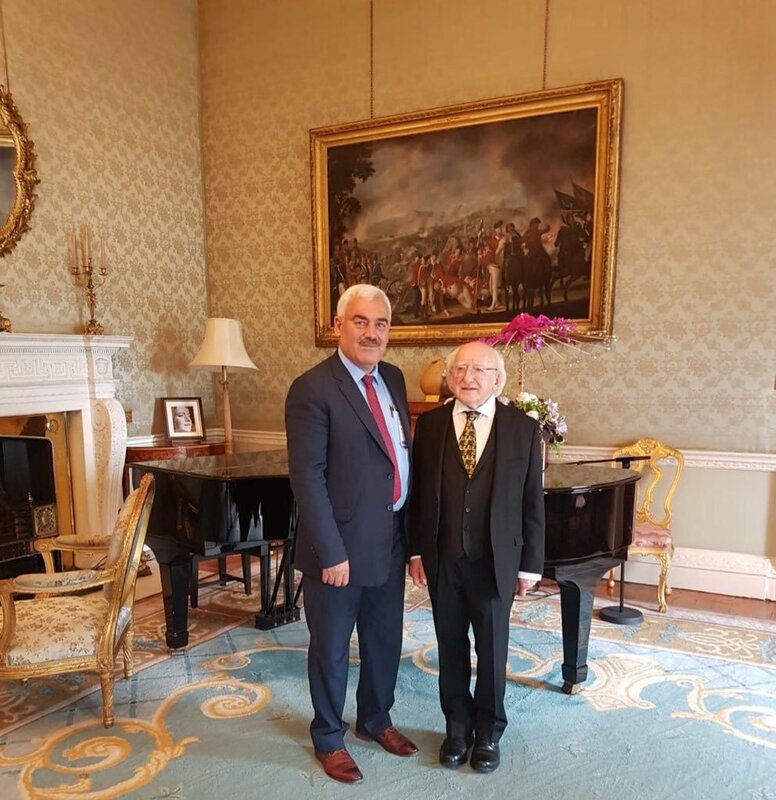 Michael D. in Oct 2018 meets Shawan Jabarin of the Palestinian group Al-Haq. Jabarin was jailed for PFLP terrorism and Israel claims he is still linked to the PFLP. 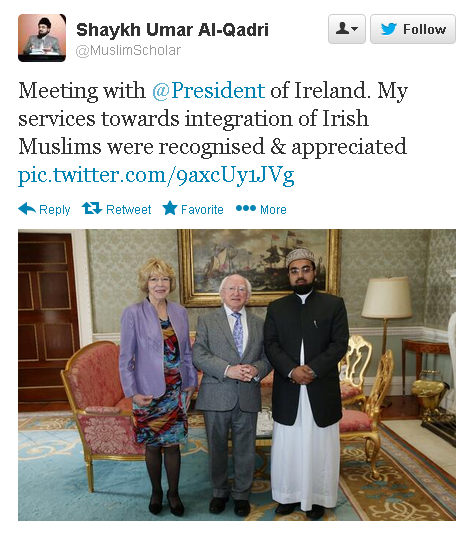 Michael D. has a particular love for the far right, Muslim Brotherhood linked Clonskeagh mosque. The head of the Clonskeagh mosque says that gays should be executed. At the inauguration of Michael D. as President in Nov 2011, an Islamic prayer was said by Nooh al-Kaddo of the Clonskeagh mosque. Michael D. spoke at the Clonskeagh mosque in Nov 2016. He congratulated them for "fighting prejudice". At the second inauguration of Michael D. as President in Nov 2018, an Islamic prayer was said by Ahmed Hasain of the Clonskeagh mosque. Nooh al-Kaddo is interviewed for a DIT student magazine in 2006. He is being asked about the "Muhammed cartoons" riots and killings in which angry Muslim maniacs bombed churches and burnt Christians alive. He is a religious loony: "The problem is that in the West you do not know what Mohammed means to me, as a Muslim believer. He should be before myself, before my family, my children, before my wealth, before everything." His alleged belief in "free speech" is a complete jumble: "If you are affecting my freedom by affecting my belief then that is not freedom. True freedom is when you say things that are true. There has to be some kind of limit. If I don't receive respect what worth is my freedom?" 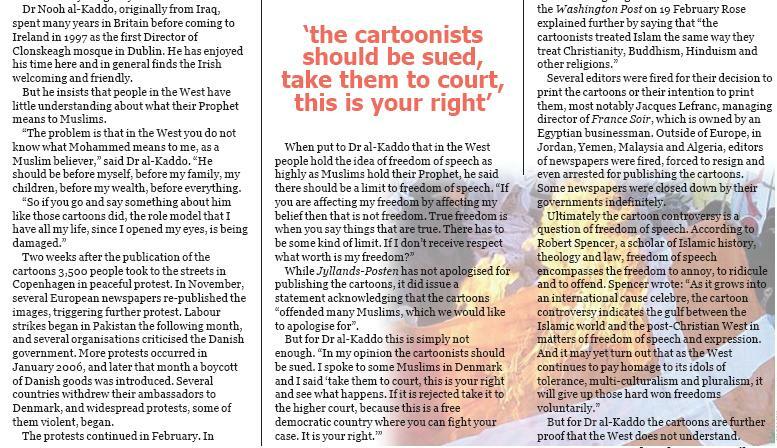 He declares that it should be illegal in Ireland and the West to blaspheme against Islam. And this is a man Michael D. thought suitable to bring to his inauguration! 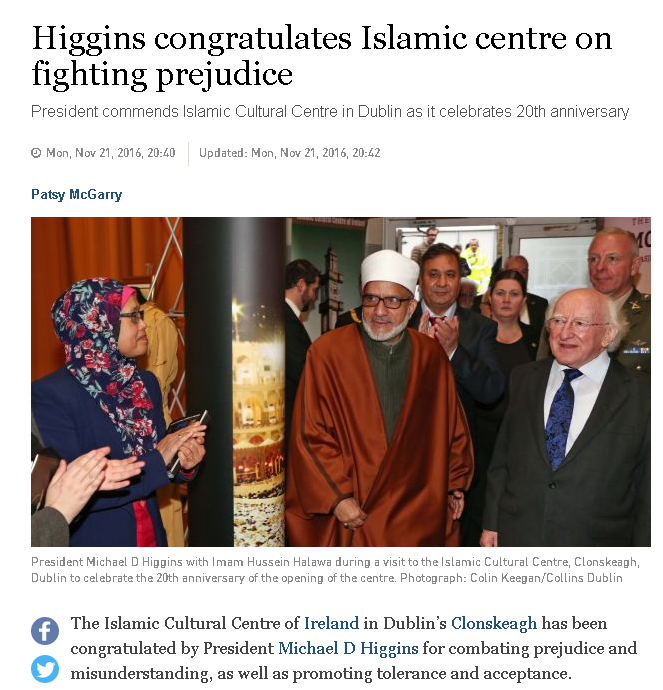 Irish President Michael D. Higgins congratulates Hussein Halawa for "fighting prejudice", Nov 2016.